It is important to find ways to sleep better if you work night shift. Working night shift interferes with the natural rhythm of the body. Our bodies follow a daily cycle in response to the amount of light and darkness we experience. This is a biological cycle which governs our physical, mental and emotional function. We interrupt this cycle when we perform shift work. It is not as simple as sleeping during the day and staying awake all night. Our bodies are not programmed in this way. 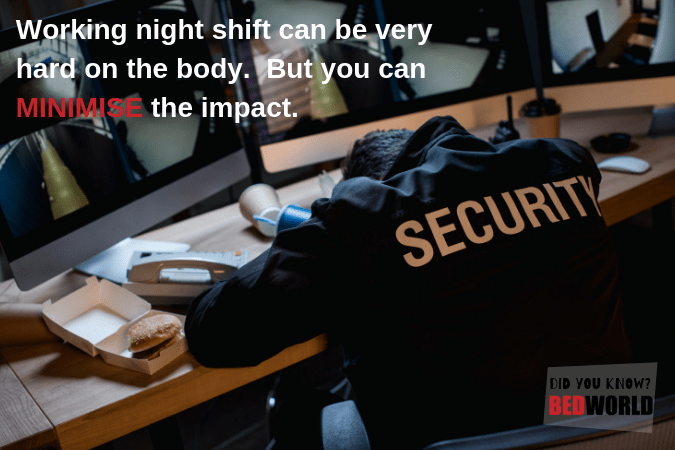 Night shift work can have serious health impacts. Unchecked it can result in an increased risk to many diseases such as diabetes, cancer, obesity and depression, amongst others. Why is night shift necessary? Some industries are beginning to implement shifts to ensure that production machinery is never left idle. This makes the business more profitable, and creates more job opportunities. There are many industries operating and functions taking place at night whilst the rest of the world sleeps. Airports, long distance transport, IT support functions, hotel and bar staff, to name a few. Many essential functions are needed 24/7 that are critical to the safety and well-being of our society. This needs dedicated people that are prepared to work the night shift. This should not come as at the expense of personal health. It is important to take steps to minimise the impact working hight shift has. How can you sleep better if you work night shift? Block out curtains are very effective and can turn a light and bright room into a dark haven. A sleeping mask can also help. The ideal temperature for sleep is between 15 and 19 degrees. It is often difficult to create a quiet environment during the day. If there is too much hustle and bustle when you are trying to sleep consider using ear plugs. You can also use white noise such as a blowing fan. A mattress that is supportive and comfortable will make all the difference to your sleep. Speak to a Bedworld consultant for advice if it’s time for a new bed. If you have to do night shift work, make sure that you are getting the best sleep possible so that you do not compromise your health.